The idea behind the color scheme is that my human team will be the New Empire Patriarchs (going for the obvious pun on New England Patriots) and so I went with a red, white, and blue theme. Most of the color on the other minis will be on the armor with the cloth parts being white, but since Zug is not actually wearing a whole lot of armor, his kit ended up being mostly white… which is a very hard color for me. Oh well. Future minis will have more color to them. Now, obviously I am nowhere near a “pro” level painter, and I do not claim to be, but I made a realization while painting this mini. For the last several years I have been steadily working on improving my painting level, and for the most part I have gotten much better. However, for every action, there is an equal and opposite reaction… The higher levels I attempted to achieve while painting these minis, the longer it has taken to paint. The longer it takes to paint, the more I hate painting. The more I hate painting, the more I completely dread even looking at my brushes. As a result, I have not really painted anything at all in MONTHS. With all of this in mind, I have decided to dial back my painting levels from now on. While I know that I CAN do better, if attempting to do better keeps me from even trying, what is the point? With as many minis as I have piling up, I would rather have more minis painted to an OK level than a small handful of minis painted to a much higher standard. In other news, Games Workshop has announced a new boxed game that is reported coming “very soon” called Shadow War: Armageddon. The reason this is cool is because by all reports, its rule set is basically Necromunda, but opened up to a dozen standard Warhammer 40K factions. It also comes with some pretty awesome looking plastic molded, NOT CARDBOARD terrain. Necromunda is my favorite GW game that I have never played. I am on the fence about picking the game up because there is no guarantee that we will actually play it, and with the terrain, I expect it to be the polar opposite of cheap, but it definitely looks cool. I also wanted to give people a little heads up on some “coming soon” items to look out for on the blog. First up is that I ordered the new Forge World Rat Ogre and Griff Oberwald resin minis. Those should arrive next week, so I will be doing unboxing posts for those as soon as I get my hands on them. 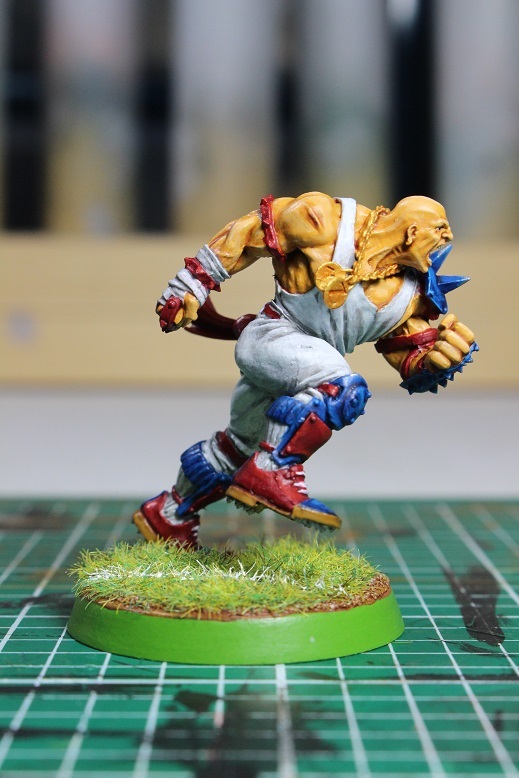 Not related to GW but still Blood Bowl, months ago I backed crowd funding campaigns for both the Iron Golems Pro Box set and the JBone Industries Slann Team, sculpted by none other than Pedro Ramos. Both of those campaigns have finally shipped their products, so I will write unboxing posts for both of those as well. Last up, I have a favor to ask readers… I am currently looking to get my hands on a Grak and Crumbleberry set of Warhammer World exclusive minis. I would prefer not to pay eBay prices for them, so if anyone close to Nottingham reads this and can find it in their hearts to help a fellow BB addict out, I will gladly compensate you for your time. I even have a few Referee Packs I can trade if anyone needs those minis. If you can help me out, let me know in the comments below. 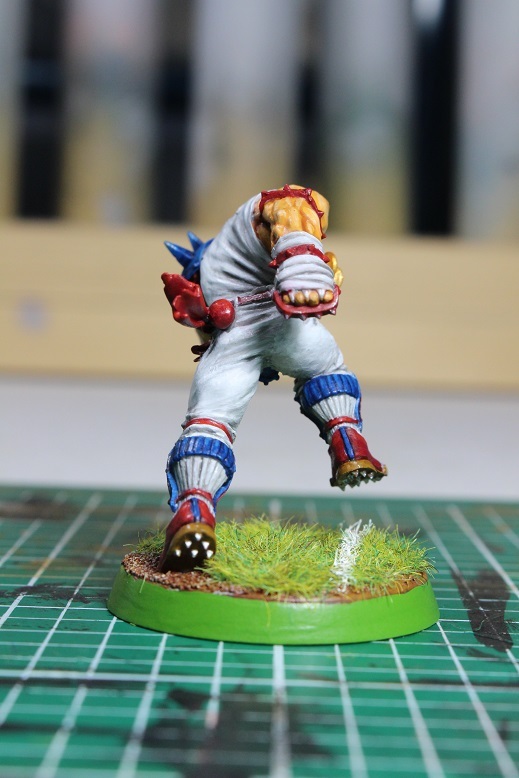 This entry was posted in Blood Bowl, Gaming and tagged Blood Bowl, Both Down, Forge World, Forgeworld, Games Workshop, gaming, Griff, Griff Oberwald, Iron Golems, Mighty Zug, Miniatures, Necromunda, Orclahoma Bowl, Rat Ogre, Shadow War: Armageddon, Spiky Cup, table-top games, tabletop wargames, wargames, Wargaming, Zug by Mike C. Bookmark the permalink. i am still eyeing the dwarves and trying to figure out the best way to chop the slayer beards and put their feet on the ground. Nice write up. You have summed up how I feel about painting right now, I think like you I need to chill out and cut myself some slack…. 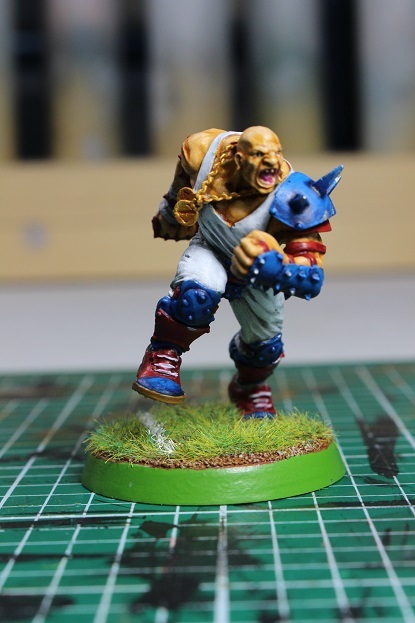 When I get around to building the new human team they will be a very similar colour scheme to yours, now I have something to base my Zug on, thanks! That is great job you’ve done on Zug, how did you the white, was it achieved by using an ink/wash in the recesses? i used a light gray primer, which is pretty much the exact same color as Vallejo Game Color Stonewall Gray. i base coat all the other areas first, then clean up the the “white” areas with Stonewall Gray, leaving most of the gray primer visible as a base coat. then i use a gray wash and again cleanup with Stonewall Gray. then i layer up with thinned down white. at least, that’s what i did here. i am going to drop the layering moving forward. it looks great, but just takes too much time. Grand, thanks for the update. 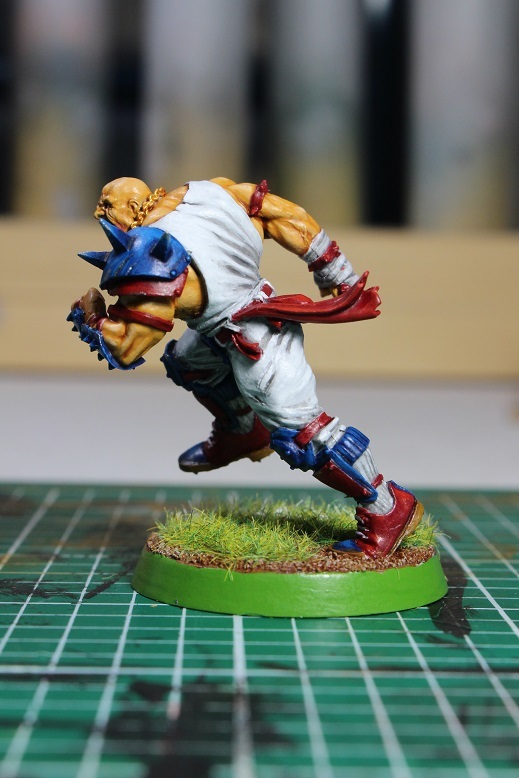 Just to let you know currently on eBay.co.uk there is a “pro painted” Zug going for £80! Yours (in my opinion) is miles better. Keep up the good work.